Sir Eduardo Paolozzi CBE RA, a Scottish sculptor and artist, was born in Edinburgh, 1924, the eldest son of Italian immigrants. As a child he developed a keen interest in popular culture, collecting cigarette packet cards with images of Hollywood icons or military vehicles. This subject matter would come to greatly influence his future art. His early career was deeply influenced by Surrealism, however he is also credited with launching the Pop Art movement. 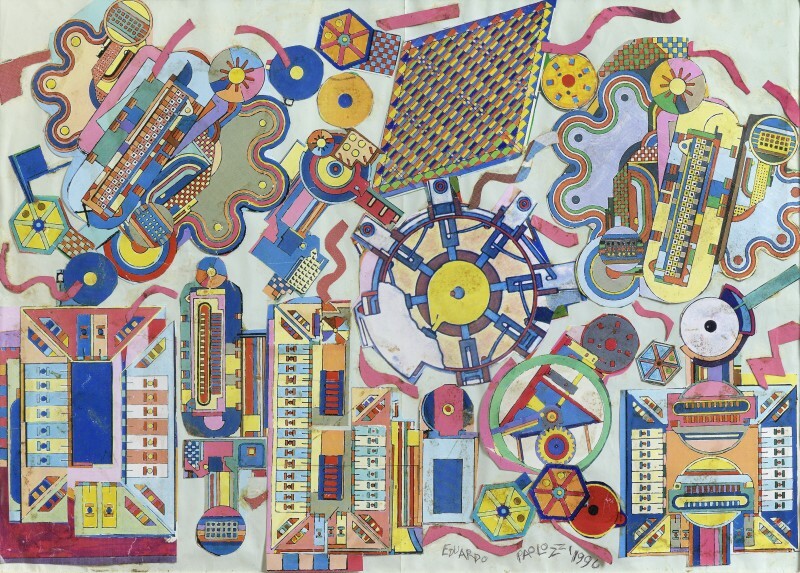 Paolozzi gained recognition as a sculptor, particularly through his ‘Art Brut’ style. His career is defined by constant experimentation resulting in not one singular artistic identity. Paolozzi studied at Edinburgh College of Art in 1943 and for a short period of time at Saint Martin’s School of Art in 1944. He continued his studies at the Slade School of Fine Art at University College London from 1944 to 1947. After completing his studies he moved to Paris from 1947 to 1949, where he met Jean Arp, Alberto Giacometti and Georges Braque. In the late 1940s, Paolozzi created a series of wax sculptures, adorned with machine parts and found objects, which showed an influence of Surrealism. In 1949, Paolozzi returned to London, establishing his studio in Chelsea, sharing the space firstly with Lucian Freud and then William Turnball. In this period he was deeply influenced by Francis Bacon’s risk-taking approach to art. 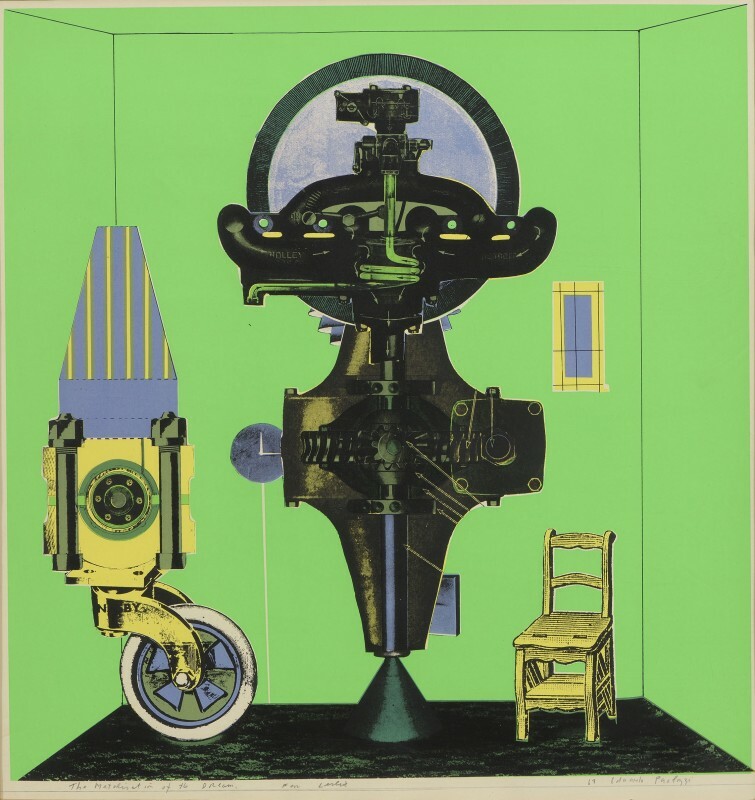 Around the same time in his career, Paolozzi began to appropriate images from American advertising in the creation of his art, as seen in I was a rich man’s plaything(1947). In so doing, he gained a reputation as one of the pioneers of Pop Art, and was one of the founders of the Independent Group, a forerunner to British and American Pop Art. Paolozzi also participated in the Independent Group’s landmark exhibition This is Tomorrow at the Whitechapel Gallery in 1956. He has since featured in many museum survey shows of Pop Art around the world. In the 1960s, Paolozzi taught sculpture and ceramics at various different institutions, including in Hamburg, Munich and California. In 1979 he was elected a Royal Academician. Paolozzi also created and designed multiple large-scale works for public spaces, most notably his mural mosaics for the Tottenham Court Road underground station. In 1994, Paolozzi donated to the Scottish National Gallery of Modern Art a large quantity of his work, while Pallant House Gallery in Chichester staged a major retrospective in 2013.